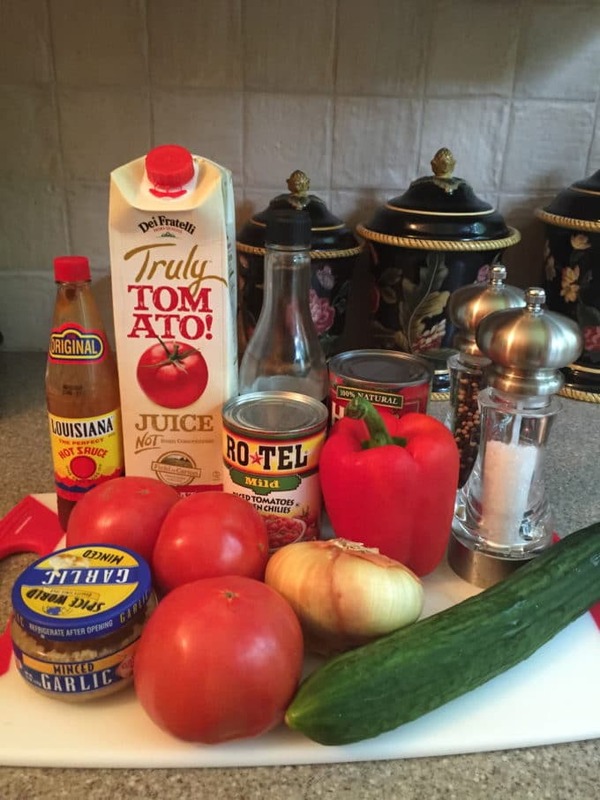 Would you like to learn how to prepare Gazpacho? Are you wondering exactly what Gazpacho is and what’s in it? How about how many calories are in Gazpacho and what’s the nutritional value? And, for goodness sakes, how do you even pronounce Gazpacho? It’s been so hot here lately that the last thing I want to do in the evenings is to stand over a hot stove and cook dinner. So we have been having salads almost every night. Today, I thought I would shake things up a bit and make Gazpacho which is just a liquid salad! Gazpacho (pronounced gaz·pa·cho) is a Spanish-style soup made from tomatoes and other vegetables and spices, and it is served cold. 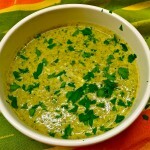 It is a cool, refreshing and best of all, healthy soup and very low in calories. It’s also a family favorite, good for lunch or dinner and one of my “go-to” dishes in the summer. Before the Gazpacho police chime in, I have to confess this is not the original Spanish or Portuguese recipe, which typically includes toasted or stale bread. Instead, this is a quick and easy version which uses canned tomatoes and tomato juice. Of course, you could also substitute fresh tomatoes if you have them. With this recipe, my food processor does all the heavy lifting, and basically, all I have to do is mix everything together and serve. This Gazpacho recipe is quick and easy, and you can have a nutritious meal on the table in ten minutes flat! But the best part is besides being loaded with vitamins and minerals; this cold, delicious and refreshing soup only has 78 calories! 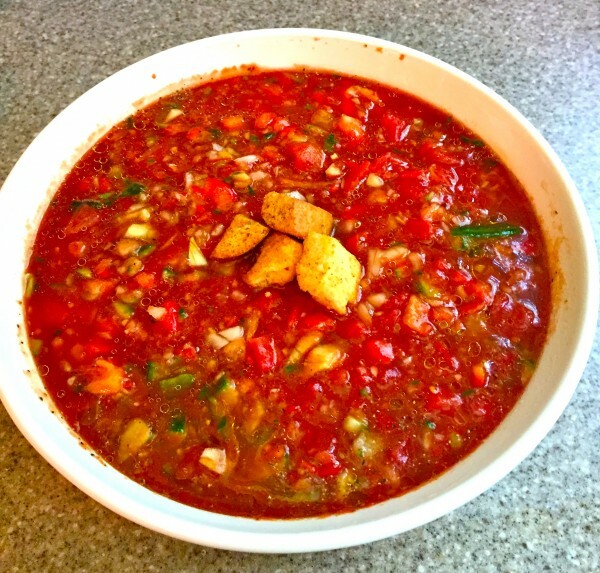 The ingredients for this tasty soup include bell peppers, an English cucumber, a small onion, a can of diced tomatoes, a can of diced tomatoes and green chilies, minced garlic, tomato juice, red wine vinegar, lemon or lime juice, olive oil, and kosher salt and pepper. To make the soup, gather all the ingredients. 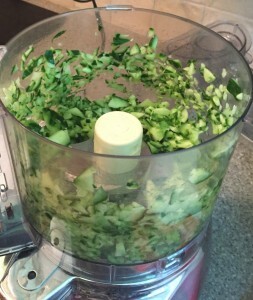 Finely chop the bell pepper, onion, garlic and cucumber using a food processor fitted with a steel blade. Process them separately. Pulse about 8-10 times or until the vegetables are in small pieces. 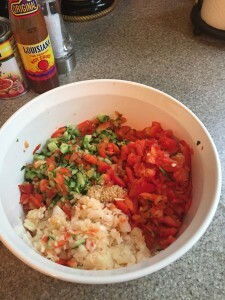 Add all of the chopped vegetables to a large bowl along with the diced tomatoes, diced tomatoes and green chilies, garlic, tomato juice, red wine vinegar, lemon or lime juice, and olive oil. Stir and add salt and pepper to taste. Chill and serve. It’s even better the second day. 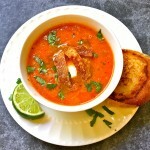 Cover and refrigerate any leftover Gazpacho, and it will keep in the refrigerator for 2-3 days. 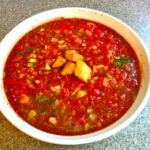 Gazpacho (pronounced gaz·pa·cho) is a Spanish-style soup made from tomatoes, and it is a delicious, no-cook, healthy soup and best of all, very low in calories. After processing all of the vegetables, add them to a large bowl and add the diced tomatoes, diced tomatoes and green chilies, garlic, tomato juice, red wine vinegar, lemon or lime juice, and olive oil. Stir well and add salt and pepper to taste. Love Soup? 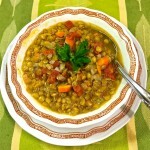 Check out the recipes below for other quick, easy, delicious and nutritious soups! 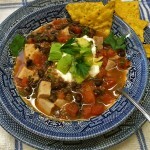 Tomato Tortilla Soup, Broccoli and White Bean Soup, Lentil Soup, and Roasted Pork Stoup (no that isn’t a typo, this soup is a cross between a soup and a stew, a stoup).